Grandma's Knitting Place: And here's what is next! 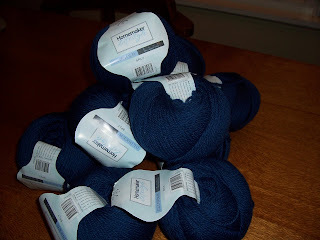 This gorgeous pure wool was on sale at Big W - and so tonight I get to cast on a sweater for Rick, Simone's SO! This is actually his last year's Christmas present - so I am going to make him a lovely aran patterned pullover . The colour is a bit paler than the picture shows - it's called Dark Petrol. I am so pleased - 100 gram balls for $2.67 each - bargain ! - and it is machine washable. The classic pattern is from an old Woman's Day magazine pullout - I have made it several times before - it only needs the extra length - amazing how short men wore their sweaters a few years back! I have been so bogged down with the Adult Surprise Jacket these past weeks - I can't wait to get started on this!! Thank you very much for the beautiful card. I shall have to have a look in Big W but I am trying to use up the wool I have. You are motivating me to knit again for the Mongolian children. Love your website! What a great find. I'm sure the jumper knitted in that yarn will be lovely and very much appreciated.